Last weekend, we roadtripped down to San Simeon to visit Hearst Castle, the Julia Morgan-designed residence of erstwhile publishing magnate William Randolph Hearst. It's a confection of a house, perched on a hill overlooking the California coast. The buildings and grounds are a California State Park, with a choice of guided tours offered. We chose the Grand Rooms tour, which took us through the main building, Casa Grande. We were one of the first to see the newly repaired Neptune Pool refilled, as it had been drained in 2014 due to massive leaks. After the tour, we had the run of the exterior, so I found a bit of shade and did a quick sketch of the main building. 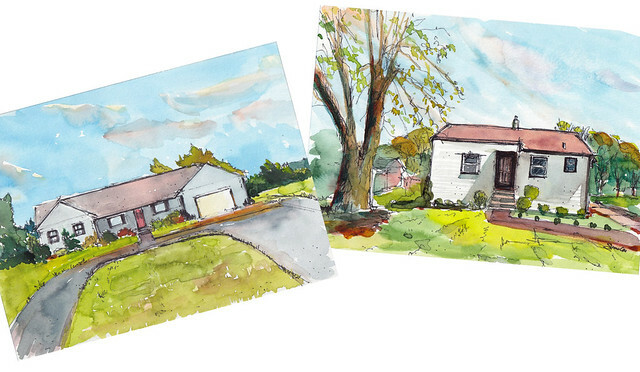 Recently I had the pleasure of working on a commissioned gift - sketches of two houses that meant a great deal to the recipient. Something old, something new. We may live in several places throughout our lives, and some are more special or memorable than others. 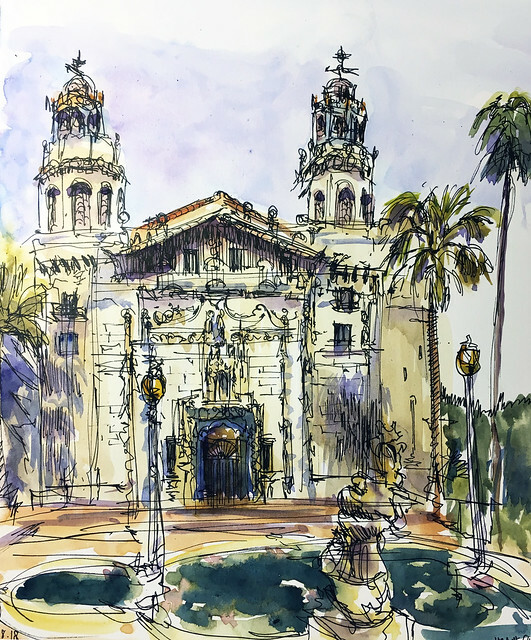 Photographs are helpful memory aids, but I like to think that a sketch or a painting offers something intangible, something more than what the camera alone can capture.